After 80+ years and countless promises throughout the history of what we know as virtual reality, it finally seems that technology has caught up to science fiction. In fact, some would argue that the ‘birth’ of AR (Augmented Reality) or Microsoft’s Mixed Reality Portal have leapfrogged us ahead of where most people even dreamed we would ever be. Here’s just a brief look at where we’ve been during the quest for VR/AR excellence. But what exactly is Virtual Reality good for? If you look at the media, you’d probably think that video game enthusiasts and marketing firms are going to be the biggest winners as hardware costs decrease and more people get access to the headsets. But, some forward thinking companies have begun to prove that this new technology is going to change the way we do… well everything! Attending a business meeting was made more innovative by Volkswagen. The German automotive company announced the release of their virtual reality app that can be paired with the HTC Vive. The app was intended to use as a digital meeting room to discuss auto design and among other things. Out are the old ways of conducting corporate meetings because the virtual reality conference room enables team members to remotely meet with the other members of the company from their own space. In addition to the meeting room, Volkswagen also retained their VR car showroom where employees can walk through the company’s other brands such as Audi and Skoda. Users can also work together on certain projects using the VR app, which according to the company is a much easier way to work with the team and save time. Not to be outdone, we’ve launched our own FREEmium VR-ready meeting space called BigBlueRoom. The future of augmented virtual reality application has gone far from its usual gaming and entertainment prospective. The learning and development sector is also seeing potential in VR as a tool for eLearning and Learning Management Systems. For example, the India-based Sankhya Infotech is able to produce VR eLearning content particularly for use in healthcare and aeronautical engineering. Virtual reality in the aforementioned applications uses Sims for medical science applications. Furthermore, public institutions such as the Homeland Security and LAPD are looking to utilize VR technology in conducting simulated disaster preparedness training courses. Businesses such as Kallidus in the UK also utilize VR technology for learning and training in which scalability and cost of the issues can be easily determined and addressed. 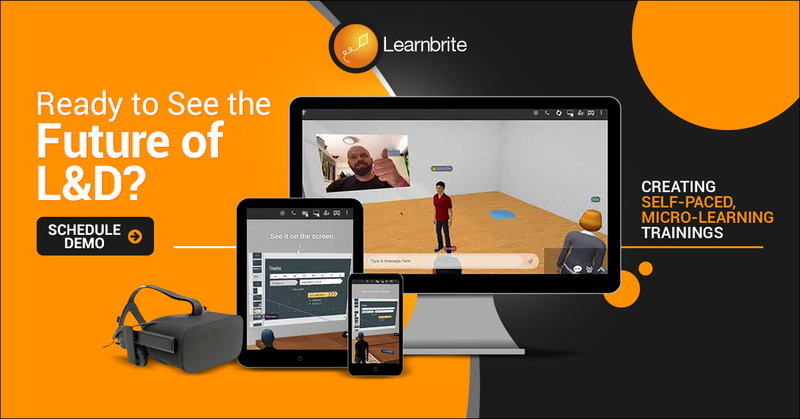 Despite the growing trend in VR applications for learning and development, the educational sector as a whole is still yet to reach a substantial capacity to support VR-based eLearning due to the cost and resources needed to build the technology to support the entire educational sector. While only a select few Learning and Development professionals and educators have begun utilizing VR in a substantial capacity, the technology is set to overtake and redefine how we learn and train. Of course, many of those who are using VR in their eLearning courses are developing the modules themselves. Which is great news for us and even better news for learners as they begin to experience the benefits of more engaging and effective learning. Thousands Of Procedures Before Leaving Med-School? Virtual reality technology has made significant contributions in improving healthcare globally. One of the best examples of VR technology applied to healthcare is the use of Precision VR developed by Surgical Theater. The VR platform helps patients to visualize their medical conditions while improving decision-making for physicians. Precision VR provides a room scale dimensional view of the patient’s anatomy and pathology made from reconstructing the patient’s DTI, MRI, and CT scans. 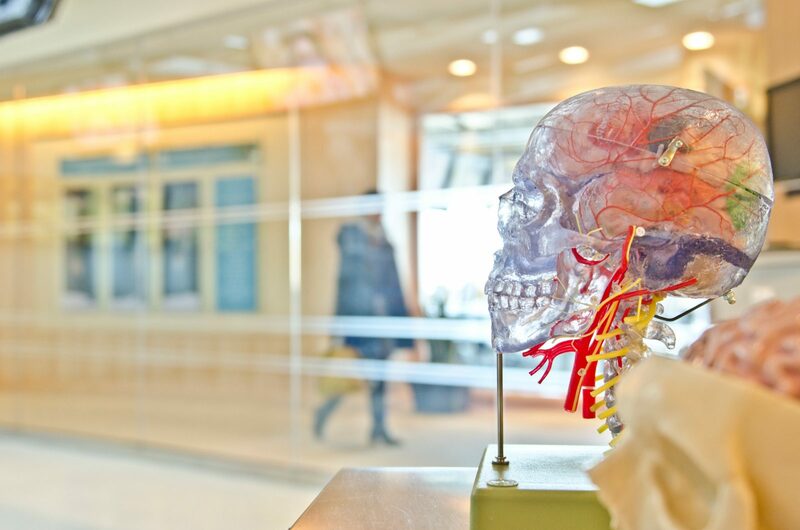 The Barrow Brain and Spine is spearheading the application of Precision VR in which both the physician and the patient can walk through the patient’s pathology and stand between vascular structures. Surgical Theater is partnering with Arizona’s largest physician-owned multi-specialty medical group to bring Precision VR into full scale implementation and revolutionizes healthcare for the future. The Death Of Resume Padding? Finding the right candidate for a job often relies on asking hypothetical questions of applicants to determine their strengths and weaknesses. Part of the process in applicant selection is the job interview and the information provided by the applicant in terms of skills and competitiveness is usually stipulated in their resumes. However, proving that the applicant can really walk-the-walk and talk-the-talk can be a challenge for the company at the early stage of the application process. For this reason a British financial institution Lloyds Banking Group have decided to put VR devices as a primary component of the company’s recruitment process. OK, so it will probably be a bit more on the serious side than Google’s Job Simulator Game (above), but the idea is similar. Applicants are placed in a 360-degree virtual environment and with the help of motion sensors, the interviewers are able to observe the applicants in performing tasks and solving issues that they are likely to encounter as an employee. This provides a unique opportunity for interviewers to test the skills potential employees claim to have before actually putting them in situations that will have an affect on the ‘real world’… besides whether they get the job or not of course. VR technology has increased its audience for the past years evolving from gaming and entertainment to being an important aspect of enterprise growth. Aviation engineering companies such as Lockheed Martin and Boeing are now investing in developing AR/VR technologies that will aid training and design. Boeing plans to cut engineer training time by 75% by using the Microsoft HoloLens to train engineers in recognizing and combining different pieces of equipment, aided by digital text pop-ups and a voiceover providing guidance. Boeing is also using AR and VR for other purposes, including development of space transportation and to speed up maintenance processes. The same VR technology is aiding Lockheed Martin in determining and correcting errors in equipment that requires precision to a hundredth of an inch such as integrated radar systems. The implementation of AR/VR in the enterprise, and its potential, are highly recognized for various industrial applications. Being the largest retail company in the world, Walmart requires innovative ways in ensuring that their employees are well equipped with the right knowledge, and skills to keep the company at the top position in global retail. One of the ways in which Walmart was able to innovate employee training is through virtual reality technology in 31 of its training academies. Walmart has partnered with STRIVR to create a virtual environment in which employees experience real-world scenarios through the use of an Oculus headset. The video feed is also connected to a larger screen so that both the trainees and the instructor can assess the situation and provide feedback regarding the student’s performance. Over the years, the VR technology has improved dramatically to allow wider application in industries where most people would have seen it as a gimmick or waste of company resources. As a leader in technological innovation, Google has always been at a constant search for better technology and one of those is the continuous development of augmented virtual reality. Google’s VR technology has been widely considered by enterprises as a solution for enabling more cost-effective on-demand training. For instance, specialty coffee companies invest considerable amounts of money in training, but the need for equipment, time, and space can be challenging. 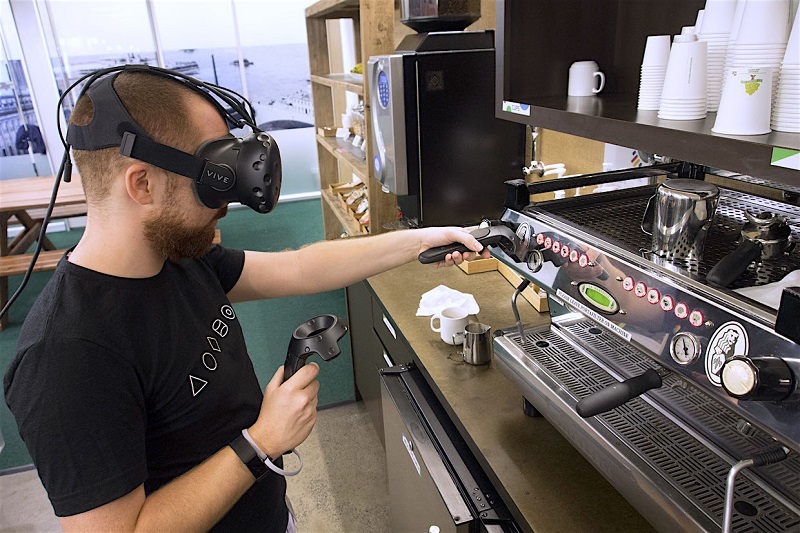 In this regard, Google’s Daydream Lab has conducted an experiment to create a virtual Barista model to test if VR technology is ready to become an alternative to an actual Barista training. The model created by Google’s VR department will enable the user to make a shot of espresso using industry grade equipment. Barista trainees were allowed to go through the reflective training from the virtual model before they can do a hands on training on an actual equipment, which for specialty coffee companies is an important step in reducing training cost. The leading French beauty and cosmetics brand, L’Oreal is taking steps in innovating the way their new hairdressers and stylists are being trained with the use of virtual reality technology. 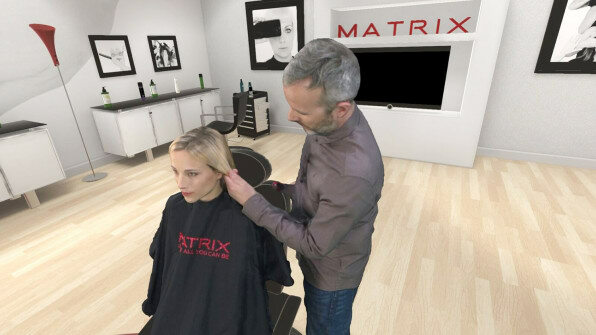 L’Oreal’s Matrix Academy for fledgling future hairstylists is now using VR software developed by 8i. The training programs they’ve initiated so far feature an immersive room scale VR experience in which trainees can experience virtual hairstyling for clients from every angle. The partnership with 8i enabled the company to use off-the-shelf cameras and automated software to capture real-time hairstyling and turn those recordings into photorealistic 3D models. VR in hairstyling represents endless possibilities of VR technology from consumer-related application to enterprise. But L’Oreal is no stranger to the VR/AR wave. Their ‘Makeup Genius’ app has been making headlines and causing a stir on YouTube since 2014. This is a perfect example of how the company is forging ahead with both internal learning & development initiatives for its professional stylists around the world as well as capturing consumer imagination through the use of innovative technology that keeps L’Oreal top of mind and more importantly, at the top of their market. If we’ve learned anything over the past few millennia, it’s that most humans learn best by doing. Sure, reading an instruction manual or listening to a lecture from an expert are great ways to get the theoretical knowledge we need. But, in my opinion, there really isn’t a better way to really learn something except by doing it over and over. That’s why before there were books and before formalized education was a thing, people sent their children to master craftsmen as apprentices to learn their trades. In fact, some large companies still rely on pairing new hires with company veterans in modern apprenticeship programs to help preserve the knowledge and wisdom gained from years on the job. But what if there was a scalable way to pass the best of that knowledge, compiled from all of your best employees in a consistent manner without taking time away from your senior staff? That’s exactly what Volkswagen is trying to do at its Wolfsburg logistics department with this new VR training tool. Experts from the Volkswagen Group have developed virtual reality applications for production & logistics that enable several participants to meet in a VR room. Following a test phase, the Volkswagen Group is now the first car manufacturer to roll out VR technology with the HTC VIVE-VR system. The Volkswagen Digital Reality Hub developed for this purpose together with Innoactive startup bundles all existing VR applications, users and tools in the Group on a single platform. When it comes to employee training, VR technology has gone far and beyond in supporting businesses in cutting cost and time to ensure that the employees’ training needs are met. Gerdau is a steel milling company in Fort Smith that developed its own virtual reality app that can go along with any VR goggles and controllers. The company’s objective is to improve its employee training capabilities wherein a real view of a steel mill’s maintenance shop is being used to simulate scenarios where dangerous situations can be determined. The company believes that VR technology can potentially improve risk perception in high risk operations such as steel milling, which involves careful maintenance of equipment to ensure safety. The leading virtual reality company in Iowa, Govred Technologies has developed simulations intended to aid police personnel training. Part of the simulations developed by the company has included a virtual outdoor situation, warehouse situation, and an outdoor shooting range. The company’s objective is to enable the local law enforcements to replicate critical situations in the field and come up with solutions to the given scenarios. In addition, the simulations provide the user with a virtual space where the feeling of being in the real world environment can be experienced. Furthermore, Govred Technologies is also venturing into developing VR technologies that can be integrated into various business-related applications. Well, that’s the multi-billion dollar question. As more and more Fortune 500 companies begin to experiment heavily with how to incorporate VR/AR into their training, marketing and even daily routines, we will begin to see an explosion of even more innovative and mind blowing uses of VR in learning & development and HR. More affordable hardware and powerful chipsets on the latest mobile phones mean that companies now have multiple ways to roll out Virtual Reality training initiatives to a much wider audience than ever before. Microsoft’s Mixed Reality Portal, bids by most of the major hardware manufacturers to produce sub $500 headsets, some of which don’t even need a computer to run, together with Apple’s newest iPhone and Google’s Pixel/Android dedication to bringing AR to the masses means that we are truly on the verge of a massive media revolution. Now, the only question is, how will you leverage VR/AR/MR in your organization? if you want to see how you can get something deployed in a few weeks without any of the heavy lifting or the need for a huge budget. Tagged AR, Augmented Reality, Mixed Reality, Virtual Reality, VR, VR in Business, VR in Enterprise, VR in HR, VR in L&D, VR in Learning & Development.